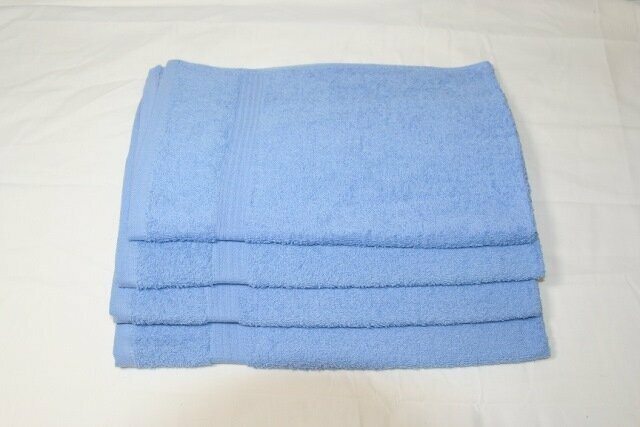 15X25-(2.4Lb) Hand towels Medium Blue in premium extra soft quality. Made of 100% cotton popular with hair salons, nail salons, gyms, schools, sports teams. Premium light blue hand towels from Towel Super Center are a great choice for spas, gyms, health clubs, hotels, restaurants, tanning salons and other businesses. These 15x25, 100% cotton are perfect for high-end businesses because they deliver softness, absorbency and a touch of luxury. When you order from Towel Super Center, you enjoy premium cotton hand towels in blue at great wholesale prices, too. Looking for superior levels of functionality from your commercial hand towels? You can't do better than to order wholesale hand towels from Towel Super Center. Durable. We offer commercial-grade towels which stay soft, fluffy and looking great even after multiple washings. This ensures a better return on your investment. Absorbent. Our towels whisk away moisture, making them ideal for fitness centers, hotels, resorts, car washes and a variety of applications. Quality made. Premium quality from Towel Super Center means attention to detail. Our towels are made from quality, thick cotton and the design includes tight stitching and dense looping for the most absorbent, quality towels possible. Affordable. We offer wholesale pricing which saves you money. We never scrimp on quality, but we do all we can to save you money. As a business ourselves, we understand how important affordable is to any company. We work hard to keep things affordable for you with tiered pricing, no minimum orders and low prices. We even take the extra step of packaging our orders tightly to save you money on shipping. That’s how serious we are about saving you money! Fluffy and soft. Premium towels from Towel Super Center deliver a luxury experience with cloud-like softness and gentleness perfect for even delicate skin. No need to worry about scratchiness when you buy from us. Our towels even continue to stay soft and fluffy after multiple washes and uses, so you never lose that soft feel. Want to know how to make sure your blue hand towels last? Pre-treat any staining agents. This reduces spotting, fraying, dyeing and color fading. Wash all soiled blue wholesale hand towels as soon as possible. Try not to keep them in a moist, dirty pile for longer than a day. Use only non-bleach detergents. Most commercial bleach alternatives will be fine for use with premium blue hand towels, but do a test run just to make sure. Fluff your blue hand towels in the dryer and then use or fold them before they have time to get cold. Towel Super Center also makes it easy to order your towels. Just place your order online, and we’ll do the rest, shipping to your door via UPS. Our customer service, easy ordering and wide selection make us a favorite with high-end health clubs, restaurants, hotels and other businesses. Order from us today and find out why more customers choose Towel Super Center when they need towels!